M11D Yeshua is the Exact Representation of Jehovah LORD | GOD Who Are You? AND Who Am I? What do Yahweh and Yeshua have in common? The truth of who Jesus is, was, and forever will be, is found in His name. Jesus’ Hebrew name—YAHWEH of the Old Testament—is Yeshua of the New Testament. Yeshua is composed of the same four letters—YHVH. God does nothing by accident. 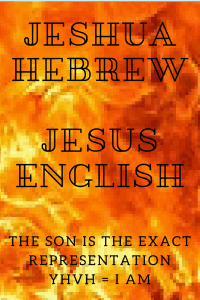 The name Jesus is the English translation for Yeshua. Ancient rabbis used to say that when the Lord reigns on earth, He will be known by his one name, YHVH, or Yeshua (see Zechariah 14:9). Jesus was a popular name in his day, but Jesus the Christ is the only one who fulfilled the meaning of YHVH—Y as humility; H as Almighty God; V as redemption; and H as springs of water. “God was pleased to have all his fullness dwell in him . . . .” (Col. 1:19). Revelation 19:13 shows Jesus on the white horse dressed in a robe dipped in blood, and his name as the Word of God. “And His eyes are a flame of fire . . . .” (Rev. 19:12 NASB). “On his robe and on his thigh he has this name written: KING OF KINGS AND LORD OF LORDS” (Rev. 19:16). Jesus is Jehovah—the great I AM who is our very being, our High Priest leading the way to our heavenly Promised Land. Just as Jesus said, “I AM,” the men drew back and fell to the ground (see John 18:6). “The Son is the radiance of God’s glory and the exact representation of his being, sustaining all things by his powerful word” (Heb. 1:3 emphasis mine), and He lives within us by His Spirit, and He has given us His name to use.